I have to admit that I had no idea who Soen were and had passed by the promo invitation on the assumption that they were a regular metal band. Fortunately though the promoter challenged my pre-conception on this – “proggy enough”, he said, and a quick scan of the www piqued my interest further when I read that the line-up included former Opeth drummer, Martin Lopez, who’s somewhat considered to be the band leader. Other musicians on the album are Willowtree vocalist Joel Ekelöf, guitarist Kim Platbarzdis and bassist Stefan Stenberg (replacing Steve Di Giorgio). 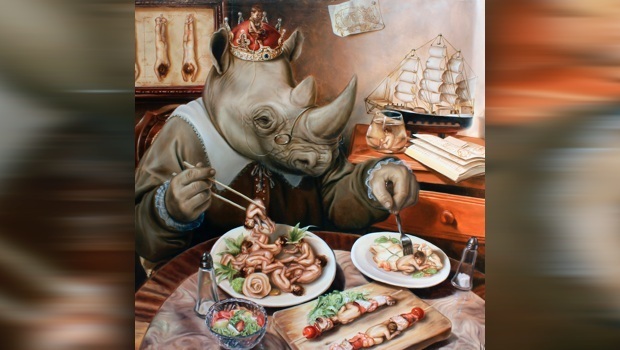 Tellurian is Soen’s second release following 2012’s Cognitive. Stylistically they’re pretty much in the same ball-park as before, although the change of bass player has altered te dynamics with Stenberg a little less “in your face” and perhaps not quite as busy a player as the departed Di Giogio. The first single from the album and second track (following the short percussive, instrumental opener), Tabula Rasa, represents the music well. Melodic modern prog-metal, quite reminiscent of Tool, with hints of Opeth. The focus is on intricate, hypnotic drum patterns, interweaving with punchy bass and syncopated guitars – no self-indulgent solos to be found here and the result is both mesmerising and fresh in equal measures. Kuraman, wanders a bit deeper into math-metal territory and brings to mind some of the disjointed acrobatics of The Safety Fire, although in comparison with Cognitive, it has a less brutal approach, leaning more towards texture and atmosphere. After an initial heavy burst, The Words turns into the most beautiful, moody song, drenched with atmosphere. Ekelöf’s singing shines in this piece, backed up with some super guitar chordings and symphonic keys (bowed upright bass, perhaps?). Three weeks after hearing the album for the first time, this track is still playing repeat in my head – a great melody! Pluton and Ennui show quite some Opeth influence and although the former starts with a tremendous Tool vibe, the vocal style and melody in the verse are a dead-ringer for Mikael Åkerfeldt with a nice vocal harmony section towards the end – not the sort of thing you would normally expect and the only place they do this on the album. The latter has an introduction and instrumental breaks that could easily have come from Opeth’s Watershed album (makes me think very much of Hex Omega), deep and heavy guitars underpinned by furious drumming from Lopez. Martin Lopez, what a superb drummer he is, combining supreme technique with a human feel that’s so often lacking with many metal musicians. I do miss him from Opeth and it’s great to hear him in action again. Koniskas and Void reprise the Tool feel, the later being adorned with more heavy Opeth references and despite running for eight and a half minutes, there’re still no solos to be found, just texture and strong melody. Things round-up with the longest cut on the album, The Other’s Fall. Syncopation to the fore once again with eastern-influenced riffing. Intricate and hypnotic, and best heard on headphones with the eyes closed, the closing minutes of the song bring to mind The Pattern by Jolly, similarly well-crated, modern prog-metal. Tellurian is a great album that will appeal to many. Various comparisons to both Tool and Opeth make it likely that fans of those bands will appreciate Soen, but also those that like The Safety Fire and bands like Jolly will find something to please them. Also worth a closing mention is the excellent cover art by Mexican painter José Luis López Galván – slightly gruesome, perhaps, but highly original and a work of art in its own right.